Kobra 240 SS5 strip cut shredder comes with security level 2 is ideal for reliable shredding of official documents. This multimedia shredder incorporates carbon hardened cutting blades, which shreds the paper, CDs, DVDs, floppy discs, paper-clips and staples in to ¼ inch strips. It incorporates many useful features. 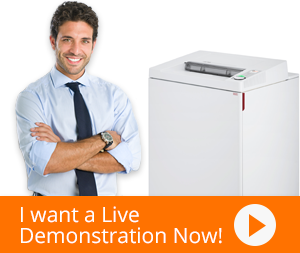 The Kobra 240 SS5 paper shredder automatic start and stop function enables hassle free shredding. It has 9.5 inches wide feed opening for inserting material. The 9.5-gallon capacity waste bin is provided for collecting shredded waste. The waste bag is removable which provides convenience in clearing waste. The waste bin comes with an intuitive mechanism for separating plastic waste from paper waste. The 240 SS5 shredder stops automatically and alerts operator via LED indicator if the waste bin is not installed properly. Kobra 240 SS5 shredder also incorporates Energy Smart system which makes it environmentally safe and allows zero power consumption power in stand-by mode. Its continuous duty and thermal protected motor allows it to under-go 24/7 operation. Weighing only 33 lbs. and mounted on castors, the Kobra 240 SS5 strip cut shredder is highly portable and can easily be placed anywhere.